We’ve launched a new podcast! It’s called Backstage Business, and it’s the brainchild of our Co-Founder and CEO, Summer Felix-Mulder. So we’re going to let her explain what the new show is all about. Just over 3 years ago, I started my first podcast with The Draw Shop — Get Genius. On that show, I would interview world-class entrepreneurs, coaches, consultants, authors, and experts. And I’d do my best to tease out their genius — the tactics and tips they used to take their companies, health, relationships, and lives to the next level. Behind every successful business is a struggle. Without exception. For an entrepreneur, challenges and obstacles aren’t just inevitable — they are a necessary part of their hero’s journey. Without struggle, none of us can hope to build the kind of business we’d be proud of! The failed product launches. The slow months. The bad days. The “oh gosh, how am I going to make payroll” cold-sweat realizations. The rock bottom of failures and the surprisingly terrifying highs of success. And yet, we have to talk about it! Because the struggle is real, and we’re all in it together. With Backstage Business, I hope to pull back the curtain on all the hard, nasty, often terrifying, and (let’s be honest) sometimes thrilling challenges of being an entrepreneur. Plus, I want to give you the insights and the actionable takeaways to deal with similar problems in your own business. Those takeaways and lessons will come from entrepreneurs and business owners who have gone through the same challenges before — or are dealing with them now! Because who better to advise you than the people who have been there, done that, and have the battle scars to show for it? You will learn from the best. You’ll get a backstage pass (backstage — get it?) to the inner workings of some of the most successful companies out there – big and small! Want to know what kinds of business challenges will I discuss with my guests? And now, please enjoy the first episode of Backstage Business! Also, to make sure you catch the next week’s episode when it comes out, please subscribe to the show on Apple Podcasts, Stitcher, or wherever you get your podcasts. 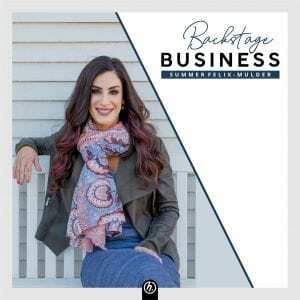 On today’s episode, you will learn what Backstage Business has in store for you: why I started this show, how it will benefit entrepreneurs and business owners like you — and how to make the most of future episodes! Get Genius interviews — listen to 3 years’ worth of mind-expanding interviews with 100+ world-class entrepreneurs, coaches, authors, and experts from around the world. Check them out while you’re waiting for the new episode of Backstage Business!